On Friday, I went home early. I got home, got into comfy clothes, and got into bed. I pretty much stayed in bed until Tuesday morning when I forced myself to go back to work (and then left early, went home and got back in bed). It has been a long week. A week full of bed-rest, chicken noodle soup, The Property Brothers, movies that have been in my queue for over a year, LOTS of water, and LOTS of cough drops. It’s really hard for me to rest like that and not feel guilty. Most likely, I’ve been fighting off bronchitis. Today is the first day that I thought “wow, I might be getting better. Hey, breathing isn’t so hard!” … I also sounded like Marcel the Shell this morning… and now my voice is cracking like a teenage boy. Between Friday afternoon and Tuesday morning, IT BECAME FALL. I missed it. (But, welcome Fall. I’m sure it was my decorations that prompted your arrival.) Ok it feels like Fall in the morning… by afternoon it feels like summer again. If someone can tell me how to dress for Fall and Summer at the same time, I’m all ears. The morning is too cold for skirts, and the afternoon is too hot for pants. GAH. I think I did some Target shopping from my bed… so I’m excited to see what arrives at my door in the next few days. Ha! As far as movies go, I watched The Age of Adaline with the boys. We actually all 3 loved it… and highly recommend it. We were totally sucked into the story and it was so well done. I watched Aloha… and well I don’t recommend anyone to see it. It was disjointed, boring, and the only thing I can say is at least the marriage was respected because I was worried about the love triangle. If I hadn’t been sick, I probably wouldn’t have finished it… but I was very much so, so I did. The third movie I watched was The Nanny Diaries, which was funnier than I thought it would be, and I liked the ending. 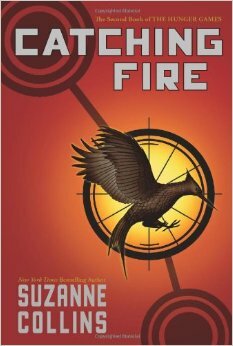 I also finished reading the second Hunger Games book (Catching Fire) so I watched the movie. The movies are good… and I think part of that is because the author also worked on the screen plays. However, the books give you such a different experience. So much of the story is told from what is going on inside Katniss… what she’s thinking, feeling, and her memories that really round out the story. Especially her relationship with Peeta… it’s pretty confusing in the movies because you don’t know all the conflict going on in her head. Obviously that’s lost in film. I love the books… and I think the movies are fun because you get to SEE what you’ve imagined while reading it, but it’s just different. Different, but I’m able to appreciate both forms of the story for what they are… and that doesn’t always happen when books I like are turned into movies. Even though it has been a rough couple of days, I am extremely thankful for my husband and my job… two things I am not always as thankful for as I should be. My sweet husband has refilled my water bottle, run to the store, slept on the couch, sat and watched movies/tv shows with me, and been so loving no matter how grumpy and snippy I’ve been. My job has been flexible, my bosses and coworkers understanding and helpful, and I have been able to ease back into work. I don’t feel obligated to stay if I am miserable, and I feel very fortunate to have a job where I am valued and play an important role, but I matter more as a person than I do a person here to accomplish a list of tasks. I didn’t make enchiladas this past weekend and I actually had a cancel a lot of plans this weekend… which was a bummer. So we’re moving enchiladas to this weekend, and hopefully I’ll be feeling even better so we can do something fun. 🙂 Also, hoping I get to spend some quality time with my sewing machine! Thanks for taking care of me, always, but especially this past week. I haven’t been this sick since Mono, and I have appreciate everything you’ve done for me. I am really looking forward to feeling better and getting out of the house again! Like date night tomorrow!!! Seriously though I’m looking forward to feeling better so we can take walks and enjoy our favorite season. But… I guess the road to recovery is paved with Mucinex and nasal spray… bleck. I miss you. Let’s go home and watch Once Upon a Time.